We picked up our houseboat at the Great River Marina and Campground. It was old, poorly maintained and had a number of safety deficiencies. The built-in electric heater/air conditioner only cooled and blew cold air around on what was an already cold day. The small propane heater, also built in, triggered the built in carbon monoxide alarm within minutes of turning it on. Fortunately, Eric and Nicky were nice people and lent us a small electric space heater that ran on the red generator sitting on the back neck about 6″ from our ears when we slept. Faced with the choice of uncomfortable cold, lots of noise, or carbon monoxide poisoning, we did not use the small propane heater and ran the generator whenever we were not in plugged into a marina outlet and ran the electric heater every night after the first cold night when no heat was available. I know the saying, “you can’t catch cold from the cold,” but it took us several weeks to get over the cold we caught we caught on this trip. We always do a pre-departure inspection of a our boat and a charter boat before leaving the dock. It is the the same basic walk around you do on a rental car. First we look for safety equipment. 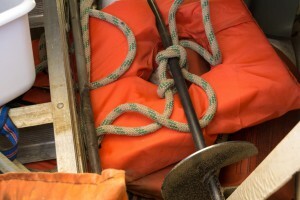 Life jackets for each person on board, throwable cushion to heave quickly to a person who may happen to trip and fall off. Properly sized jackets that can be worn for longer periods if a storm kicks up during the day. Buried in the bilge, we found old jackets that might have served for a US Coast Guard inspection years ago, but the spiders, dirt and junk piled on top prompted us to ask for more serviceable vest style (type 3) jackets that can be comfortably worn. Fortunately, Eric provided us two and fortunately, while we used them, we never needed them on this trip. 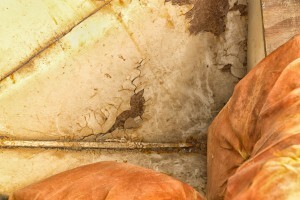 We couldn’t help noticing the rust, it was everywhere. 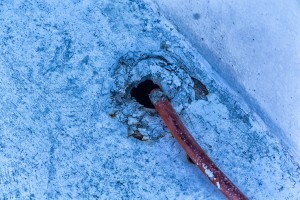 The boat had not been properly maintained and this rust had eroded the hull like a cancer creeping into the bones and robbing the boat of strength. 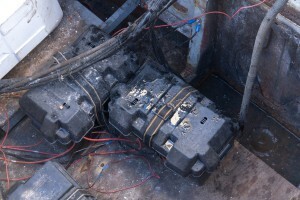 Batteries are the heart and lungs of a house boat. Everything is electrically operated and without the batteries, there is no light, no motor, no radio and no hope. We didn’t open these batteries up to see if there was adequate water. Wires were everywhere, fuses were nowhere to be found, although we did find a fuse block under the steering wheel. The boat was outboard powered and the outboard motor was capable of charging only the starting battery. This required either plugging into shore power every night to charge the batteries or running the generator for several hours each day to generate the electricity the battery charger converted to boat power to charge the batteries. The thing in the middle of the photo on the left is a small battery charger screwed into the rust. 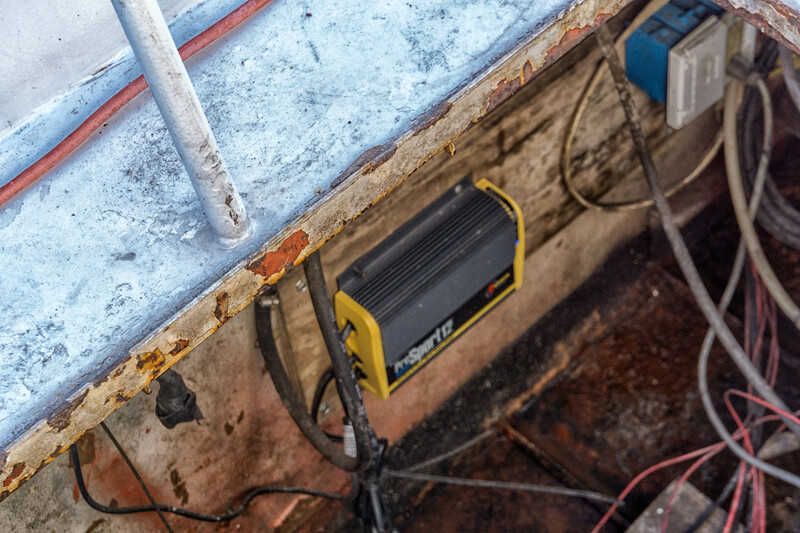 Surprisingly, it is not plugged into the boat’s power, rather a ratty extension cord is fed thru a rusty hole in the deck and plugged separately into shore power. The thing on the right that looks like a hose is the wire that powers the boat batteries when plugged into shore. It is difficult to completely describe how many code violations are encompassed in these photographs. Risk mitigation involves understanding the risks and accepting the potential harm these risks may present. 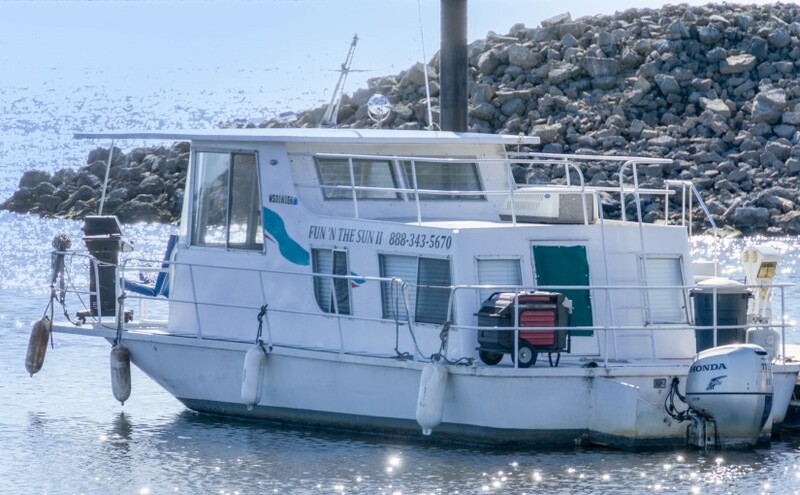 When faced with our concerns, Fun in the Sun readily acknowledged this boat was their oldest and since it was less expensive, it was among their most used. They refused to charter us a larger boat at a higher cost, but they did offer to refund our charter fee. They denied there were any US Coast Guard violations on the boat saying we were just making the rules up. We acknowledged the risks, took the boat for the week, endured what was for us uncomfortable cold, enjoyed the lovely cities we visited, and were happy to leave the boat, still floating, at the end of the week.